According to the National Air Duct Cleaners Association (NADCA), as much as 40 pounds of dust is created annually in an average six-room home. Dust, dander, and other air pollutants are pulled into the heating, ventilation, and air conditioning (HVAC) system and circulated through air ducts. A clean HVAC system won’t have to work as hard to maintain a comfortable temperature and will require less energy to run, saving you money on your heating and cooling costs. Contact Dr. Energy Saver to request an inspection of your HVAC system. After completing a thorough inspection of your ductwork system and heating and cooling equipment, our specialists will be able to determine if air duct cleaning is needed. While there is no evidence that duct cleaning will prevent health problems, there are certain conditions in which duct cleaning is recommended. There is visible mold growth inside your ducts or on other parts of your heating and cooling equipment. Ducts are infested with rodents or insects. Ductwork system is clogged with excessive amounts of dust and debris and/or you see particles being released into the air from your supply vents. Here at Dr. Energy Saver, we recommend that you consider duct cleaning and sealing as part of your overall plan to improve the indoor air quality and energy efficiency of your home. As your experienced HVAC contractor, we have the knowledge and expertise to recommend the right heating and air conditioning services to meet your needs. What does your air filter look like? As dust accumulates on the filter, the color of the filter media will darken. If your air filter looks like the one on the right, it's probably time to for a replacement. 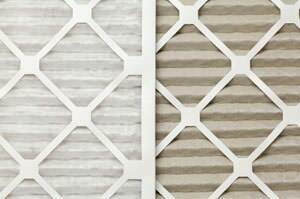 If you notice dust and debris on vent registers or dust circulating through the air when your heating and cooling system kicks on, it’s best to check your air filter. You should replace the filter when the element is visibly dirty. It's the air filter's job to capture dust so that it doesn't get into your ductwork system. Replacing the air filter when it becomes dirty will help to keep your ducts clean and your HVAC system performing efficiently. The air filter in a forced-air system should be replaced at least 4 times per year, or once per season. If it's the first time you're replacing the filter in your HVAC system, give us a call for help from one of our professionals. It’s smart to seal leaks. Gaps & cracks in ductwork joints diminish HVAC efficiency and allow dirt to enter the ductwork system. Duct sealing solves both problems. In addition to keeping your duct system clean, it is also important to make sure that your air ducts are properly sealed. 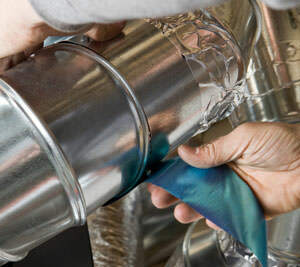 According to the Environmental Protection Agency, duct sealing can prevent pollutants like dust, fumes from household chemicals, and insulation particles, from entering your ducts and circulating through the air in your home. Leaky ducts can reduce the efficiency of your heating and cooling system by as much as 20 percent. Air duct sealing can help increase the energy efficiency of your system and lower your energy costs. We may also recommend insulating your ducts as an additional way to improve comfort and HVAC system efficiency. To stop duct leakage, contact us today to have your ductwork system inspected, tested and then sealed by our experienced professionals. We provide free estimates in Chippewa Falls, Eau Claire, Hastings, Saint Paul, Cottage Grove and surrounding Wisconsin and Minnesota areas.